Trees are graded according to their shape with premium being, in our opinion, the best. We also sell grade two and grade three trees which are still great trees, and represent great value. Six foot Nordman Firs start at as little as £20. There is also an orphan’s corner, detailed below. So whatever your budget, we will always have a fresh, local Christmas tree to suit you. All trees are individually labelled and priced according to variety and quality. Below gives you an idea of prices. Despite our best efforts, some trees just don’t want to grow perfectly. They are the rebels. The wild ones. We love different though, and different has a place at Ladydowns Christmas trees. That’s why we set up Orphans Corner a few years back. A place for different trees looking for a home. 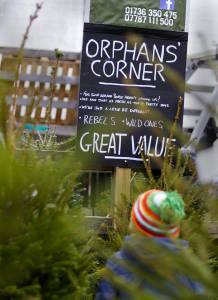 Increasingly popular, Orphans corner offers interesting/quirky/broken/lonely – (but just as fresh) Christmas trees. Look for the sign when you come and visit. They are always tremendous value for money and hopefully you will feel good giving an orphan tree a home for Christmas! A cut Christmas tree needs water. At home, take it out of the net and leave it outside in the fresh air until you are ready to bring it in. Cut an inch off the trunk and give it has plenty of water. If you are taking your tree inside when you buy it, we will cut the trunk. In the first day your tree will drink a litre of water. Keep the container topped up with water every day. The tree label has instructions. 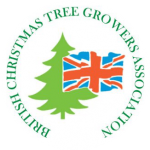 We have been members of the British Christmas Tree Growers Association since 2005, so you are assured of the highest quality and standard.